Fisherman’s Wharf in Victoria is filled with houseboats, small restaurant stands selling fresh, cook-to-order seafood, barbecue and ice cream (and other treats). After a long day of site-seeing, we sat on the pier to eat our dinner. While we were finishing, the sky was struggling to clear away the storm clouds just before sunset. As a result, I got a lovely, moody photo of the sailboats bobbing gently in the harbor. This entry was posted on Saturday, August 6th, 2011 at 10:16 PM. 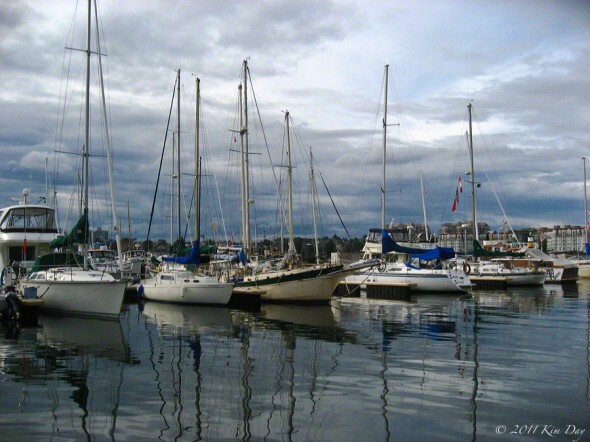 It is filed under Photo Of The Week and tagged with Canada, Fisherman's Wharf, harbor, sailboats, Victoria. You can follow any responses to this entry through the RSS 2.0 feed. I thought your video was aweosme. I was up there in Feb. 2010, I went out from Fishermans Wharf as well. Where you turned off the main road heading to your shack. My buddies shack was the other way (left from the main road #60) I pulled my perm up there. We didn’t catch much, but to me the idea is to relax and enjoy your time fishing. Thanks for your post.